Roll up your sleeves or wear them down - either way, they stay stylish and secure. The Kara Canvas Blouse features elastic at the elbows and wrists of its long, roomy sleeves, as well as a gathered elastic neckline and bottom hem for a surplice look. Made of cotton canvas, this long sleeve medieval blouse suits the maidenly fashions of many settings, making it a versatile addition to reenactment wardrobes. The neck of this canvas top features a shallow V-shaped cut-out on the front and can be worn relaxed and open or secured into a round neckline with a thin keyhole using its attached ribbon cords. 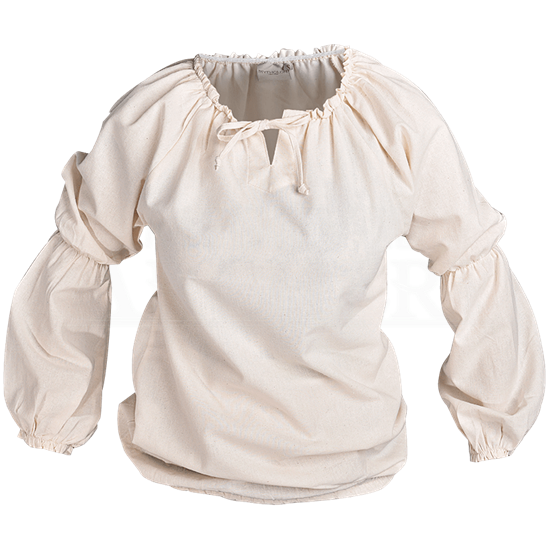 This womens reenactment top can be worn with pants for a daring pirate look or worn with a bodice and skirt to create a maidenly effect ideal well-suited to medieval, Renaissance, and fantasy settings.